Further testing by the relevant (Junior) engineer brought to light that (some of) the storage sidings on the Diagonal board just weren’t long enough. A Swallow Liveried HST set with four carriages was deemed the longest train for storage – and it wouldn’t fit. Careful examination of the previous compulsory purchase order that had been served revealed that there had been an error on the site layout by the surveyors and there was an area of land that should have been used for the trackbed……. This was duly appropriated and the person responsible for the error suitably chastised! Track realignment works commenced, and we then edged the boards to secure against the dreaded drop to the floor and started test clearance runs. Some static load testing also took place. All seemed to be going well from the first tests but then issues arose with the curved points at either end of the sidings. We originally only had one in the “trailing” position, however after the redevelopment work we ended up with one curved point at either end. Certain locos/carriages would derail, but not all. Much puzzlement and deliberations ensued – ultimately I came to the conclusion that a three way point at either end would deal with the problem. 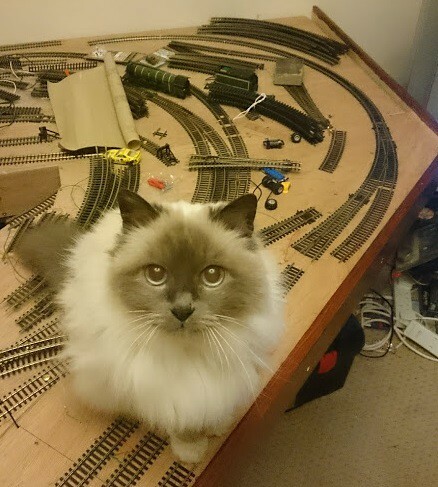 However the “Small Controller” expressed the opinion that three way points were too confusing. Hmmmmmm. Settrack curved points are always a problem, as to fit into the geometry the inner curve has to be tighter than the outer, which can be a problem with long wheelbase locos and stock. Nice cat. Love the layout idea. 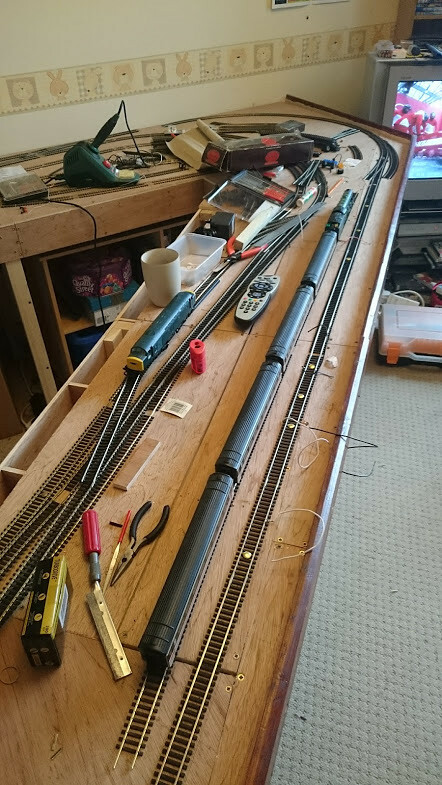 I had heard of much problems with the set track Curved points, however, on the Trackmat layout putting in a curved point had cured a rake ( pun not intended) of problems so that’s why I had given them a go. The two main culprits for issues on the extension were one or two of Flying Scotsman’s LNER coaches and the HST – both had Short wheelbase bogies???? Flying Scotsman itself, A GWR Hall class Loco, a Class 37 and a class 40 – no problems and all long(ish) wheelsets????? This wasn’t what was supposed to be happening. So I got up close and personal with the point and watched as the derailments happened. The wheelsets that were derailing were riding up on the frog as they were taking the “tightest” route through the point. I reasoned then that perhaps the Back to Back on those sets may not be the most accurate. That said, I don’t have one of those BackToBack checker/setters. Hmmmmmm. Looking at the Point I then thought “Well, isn’t the Checkrail supposed to stop the wheels from riding up the frog?” - a quick Bodge involving a small sliver of insulating tape laid along checkrail and all derailments went away as if by magic! A long term fix its not, but as a stop gap measure to cure a complete pain – it was great to hit upon it. I will have to get myself a backtoback checker and perhaps some plasticard etc. to effect a long term fix but that’s for another day……. Here’s the bodge in all its glory. As well as back to back, check the end float on the axles, as an old hand in maintaining small mechanisms used to put it, "It'll be OK if you can tell there is some but it's too small to measure" Excessive end float, combined with bogie mounted couplings is a recipe for bogie wheels trying to go the wrong way. If there is too much float, you can either try to find an axle of the correct length, or drill through the closed axlebox and push in brass cup bearings, (the shoulderless kind), and press them inwards until you are happy with the float. Pop some plastic filler into the hole once its running ok, then a touch of black paint on the end, or bright yellow if you want to imitate recently overhauled bogies. It used to be my job, when descending into New Street, to do a count of the coloured axleboxes on DMUs stabled alongside the line. I can no longer remember which colour was which but Dad had a professional interest in the numbers of "BR Timken" and SKF bearings fitted. I will invest in one of the back2back guages and then take a look at each set that is derailing and look at the axles as well. Right so - back to the Lower Station and the movement of the crossover from the Curve after the station back to the station throat to allow the Small controller direct access to both running lines from the Three storage loops on the outer loop - i.e. a train marshalled to go in either direction on the storage loops can drive directly off the outer loop and onto the correct running line. This is the "Dogs Dinner" it became... While Functionally it did the needful, it looked a complete mess with the double s curve - denoted by the Blue arrow. Trains could run happily from the outer loop to the inner loop but I couldn't warm to it - even in my "This is for messing about with trains - not realism" ethos for this railway. So I left it for a while and decided to start on building some baseboards for the upper level to check clearances etc. and see what kind of a solution might present itself while I was doing that. Nothing did - mainly because after getting the timber needed over Easter, I did no more for a couple of Months as life/work got in the way for a while...... so I did some Cork laying ( in the next post) to get the thoughts going again. 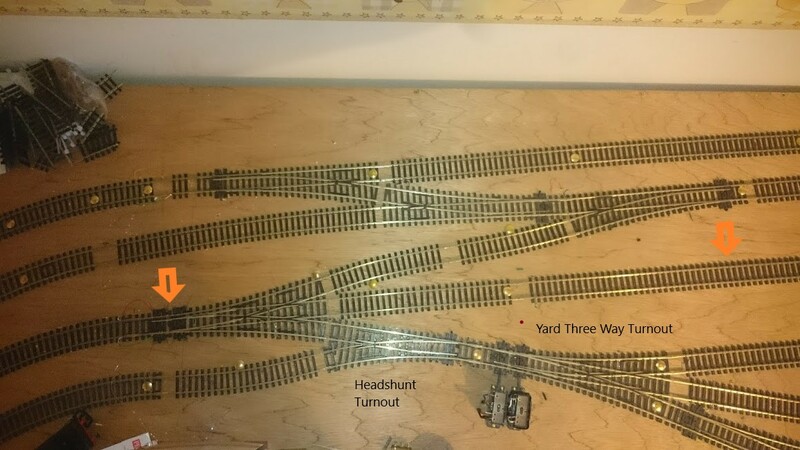 Maybe you could move 'turnout 2' to the right a bit, replace the new 3-way point with the original, and then insert a new left hand point such that the track between this new point and 'turnout 2' is straight? Turnout 1 could be a 3 way point instead with the rest left as it is (Except you won't need turnout number 2). [Referring to the lower picture]. PinkNosedPenguin wrote: ... and then insert a new left hand point such that the track between this new point and 'turnout 2' is straight? Unfortunately not- there is a baseboard joint just to the right which would preclude that. luckymucklebackit wrote: ... and move the crossover with turnout 1 to the right, effectively swapping position with turnout 2...? I think it would also fall foul of the Baseboard joint. I will take some of my spare turnouts and check the fit. This is the conclusion I came to as well, I think this could well be the winner - I had also considered losing the two crossovers on the outside loop with one Scissors crossing sited on the baseboard to the right....... But then I realized when I was looking at it that a three way point would also do the job much cheaper. I think what I will do as I am laying the cork is to take the goods yard three way point and put it in place of Turnouts 1&2 and shuffle the other turnouts until I have as easy a flow for the trains as possible, also allowing for a wider Island platform, I could do this as I had further thoughts on the Goods yard layout after testing - lose the loop, put in a doubleslip for the throat, hmmmmm - watch this space ( or possibly the planning thread ). The Peco double slip is space saving but not necessarily as space saving as one may imagine, though you do have the space available for at least one if you decide to. They do provide a little something special for your railway. It is something that years ago I just had to buy because it was there! £59 How can they justify the excessive price? German modellers must be rich... (Or used to be before they bought a double slip! ). 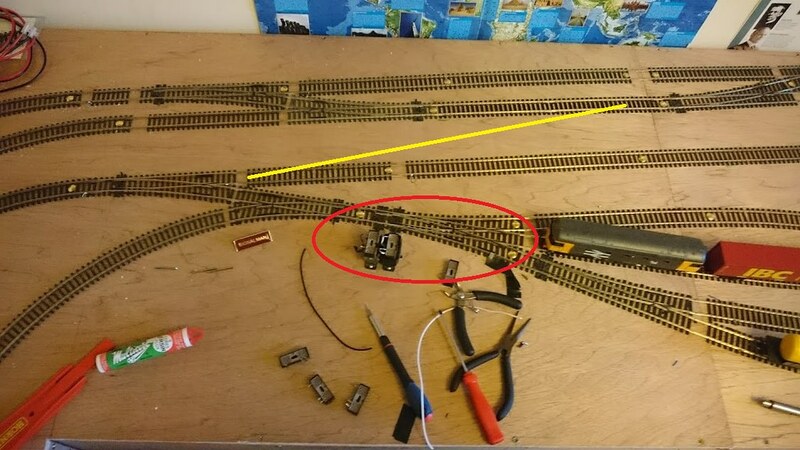 As we tested a bargain ( eurostar with four carriages for 50 euro) picked up today at a local show, another thought occurred to me - I have added a couple of inches in width of baseboard at the TV corner which means the inner loop could now be moved closer to the centre of the layout ( see orange arrows below indicating the direction of movement), leaving the middle loop line where it is. This would then allow the three way point on the inner line to link to the turnout on the middle loop without the S curve - I think. Also gives me a wider Island platform. A brief check this evening with a Standard long Hornby straight would suggest that moving that line about an inch southwards might be all that was needed. this should not impact too much on the Yard area. RE the double-slip, My thinking on the two goods yard is that they will be a pair of Shunting puzzles for my entertainment while other formations circle on the loops. To that end I would see one feeding the other, from some industry or other, and empties returning along the main line - all on the inner loop. 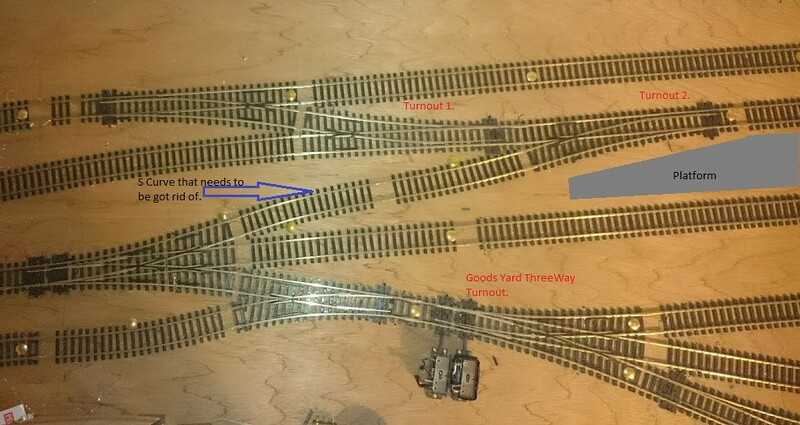 No need for a runaround loop in the yard then, as the trains would always reverse into the yards..... so, lose the three way turnout in the yard, which also loses the line closest to the platform and another point at the other end of the loop. Keeping three shortish lines and a headshunt. Also allows more scenic development. 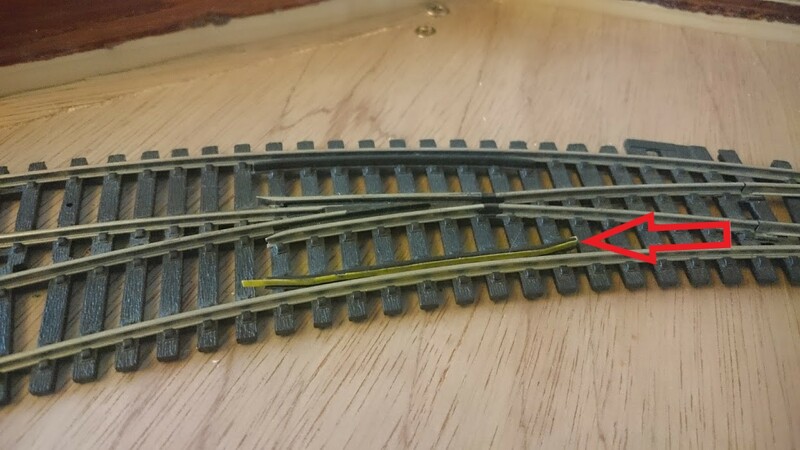 Now, seeing as I'm losing the threeway turnout in the yard, if I also got rid of the headshunt turnout at the same time and replaced them both with a double-slip, then I'm hoping it would ease the curve into the headshunt as well. Something I've wanted to do ever since I laid it. 1. Continue laying the cork underlay under all tracked areas and glue in place the outer loop. 2. Once I am happy with the outer loop, relay temporarily the Station area on the fresh cork with the musings above and test the practicalities again. 3. If at any point in steps 1 & 2 I get bored or need inspiration, start building the baseboards for the upper station area. "Simples" - as a Meerkat of my acquaintance might say.